...were one of Julie Andrews's favourite things. Here's one of mine. A blast from the past, some old Minifig's boxes. 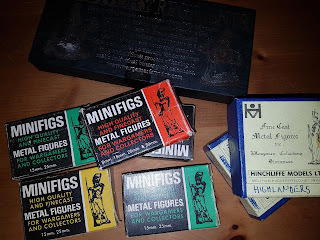 A couple of the fabled Hinchliffe blue boxes, and a more recent offering from Foundry*. Okay, completely superfluous and adds an extra cost to figures, but you've got to love a little box haven't you? * don't worry, I haven't gone over to the 28mm side, I bought some paint from them.